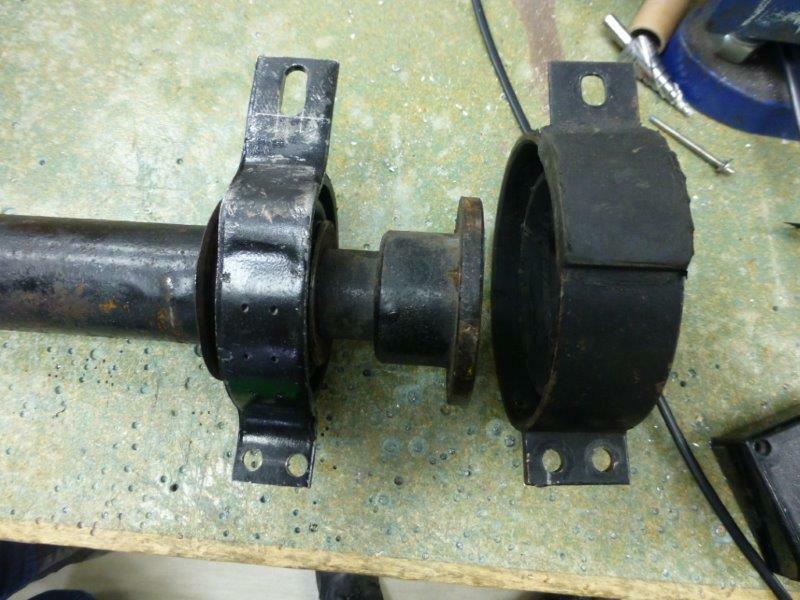 Anybody know where I can get a good centre support for a split Fastback prop? 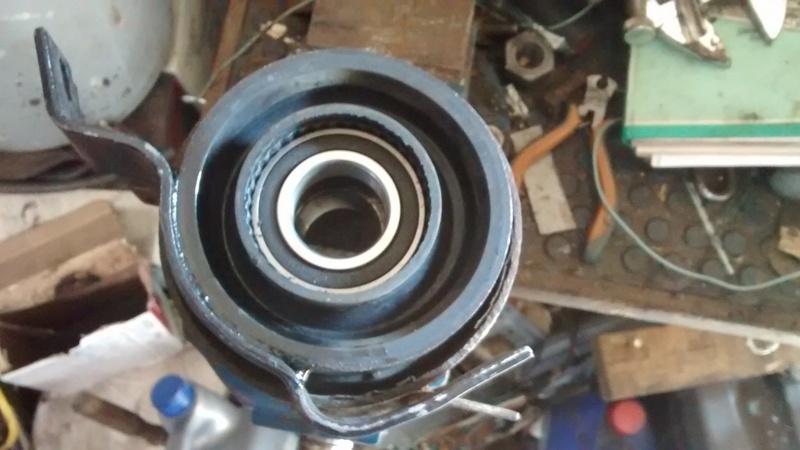 The bearing is fine. it's the rubber that's gone. Alternatively, where might I get it 're-rubbered'? Or maybe there's an equivalent I can modify from another vehicle? I'm in the same boat Mike. The irony is that it was spotted by the examiner at the MOT station, but he couldn't fail it, only list it as an advisory cos there's no check box on the DVLA site to identify it as a fault. At the time he showed it to me the rubber was perished and had split from the outer case. Not that made any difference to the outcome as I hit a pot hole on the way back and.... bonk a donk a bonk bonk bonk a donk.... and it was completely goosed. No rubber there at all now. Anyway have already measured the shaft cos is no chance of finding a NOS one. Think I might have identified a potential replacement just waiting for the guy to confirm the dimensions. Building the 'Mark II' fastback Rapier ('Arrocuda'). That sounds good news in the long term. 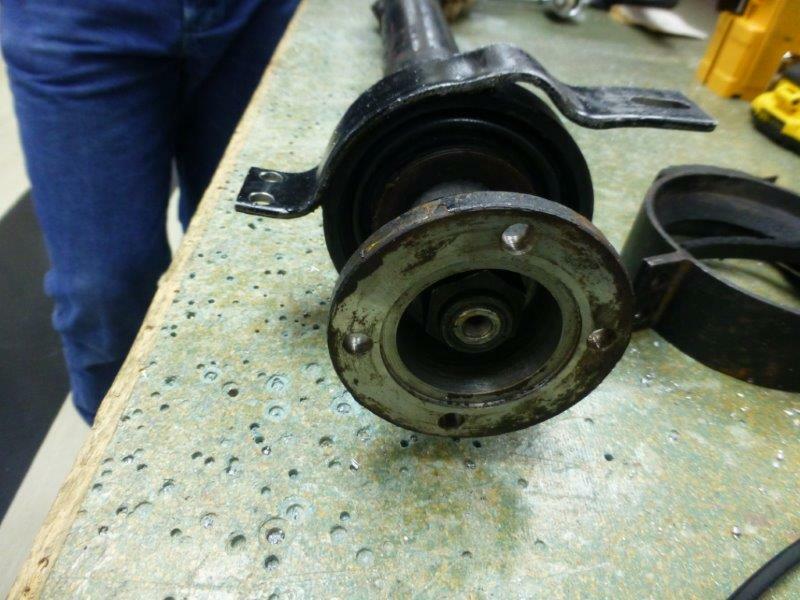 Any NOS we find will have been sitting on a shelf for 40+ years and those from a car will be in a similar state as ours! Car is back up in the air now awaiting the arrival of the bearing. I've formulated a plan for the replacement which is mainly all about modding the mounting arrangement but will put some pics up as a guide for anyone facing the same problem. Should have it tomorrow all being well. Bearing arrived and although it wasn't the width I had in mind I'm fairly certain it will do the job. Here it is side by side with a 'spare' one I had that turned out to be almost as knackered as the one I need to replace. I'll be back with more pics of the job as it progresses. It looks like you may just have to 're-arrange' the mountings. How does the rubber compare: Is it as least as thick as the original? What vehicle is it supposed to fit? The only thing is that the bearing set width is 15mm, whereas on ours it is 25mm, but you can't get a 25mm without increasing the race diameter to 40mm. The shaft on the rapier is 30mm so is no way around it but my plan is to cut the race out of the old bearing set into 2 x 5mm wide sleeves, so as to cover the shaft on either side. 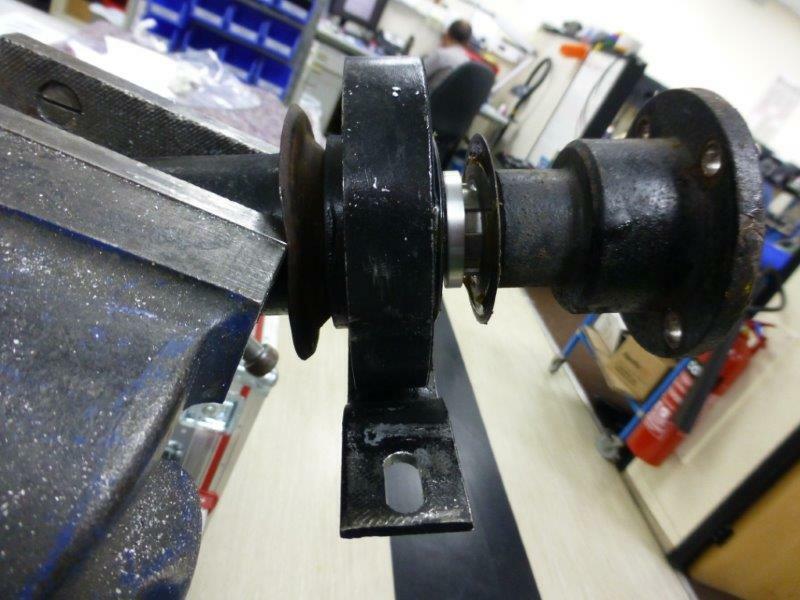 You need to align the shorter 'leg' of the new bearing with the shorter leg of the old one like so. I then straightened the longer leg just by squeezing it between the jaws of the vice. From there you can bend the longer one around the case like so. It's tough stuff to bend cos you can't use the bearing case itself as a pressure point. I ended up using some old stainless bar with a very sharp U in it as a jig, but you may have to improvise. Once you've got it here you will find that it just almost lines up. From here I just used the angle grinder to cut a slot about 1.5mm deep using a 1mm thick disk and pulled it back into alignment with the original. 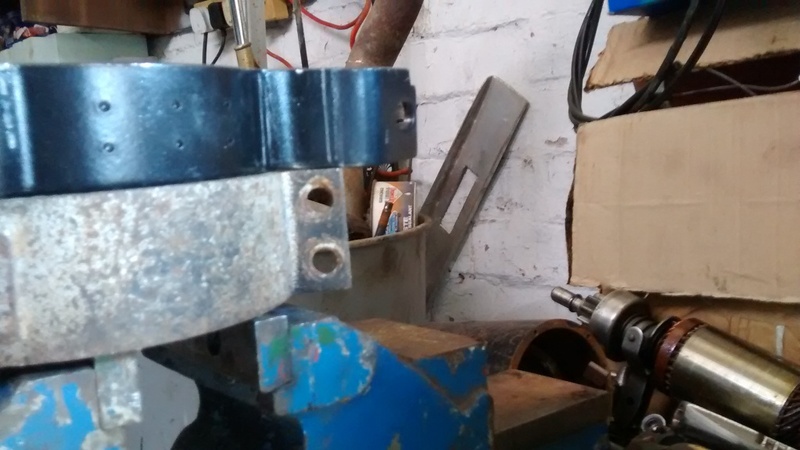 After that I carefully welded the cut a little at a time so as not to overheat the metal and damage the rubber and drilled a couple of holes in the short leg to match the original mounting point on the other side. Just needs a little black paint over the shiny bits and it's ready to go on. Next job is to drop the prop and take the old one off. The part you've scored & welded: looks a little short now. It'll be interesting to see if you have enough slot to fit as it is, or after some more surgery. TBH there's very little in it as although the bar is a touch shorter, the hole is nearer the end, so maybe 1 - 2mm difference, but can always take a little more out if needs be. There is also a fair amount of float in the bearing, which should provide enough wriggle room for the holes to line up. Have dropped the prop off and cut the old bearing down to just leave the race and then sliced it into 3 pieces with the cutting disc. 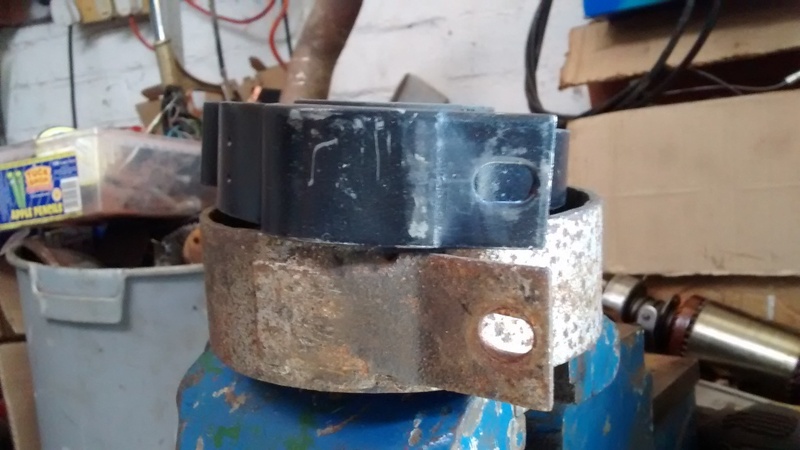 The aim is to have 2 sleeves both 5mm in width to fill the gap either side of the new bearing. I cut them both deliberately slightly oversized, so I'm hoping to grind the excess off on Sunday morning. I notice that they have sold out since I put the link up. When I bought mine there were four left and now they've gone. Bearing in mind, (every pun intended), that that is probably not far short of the number of Quattros left on the road these days, the guy must be scratching his head big time right now. Finally beat the new prop support into approx. the right shape and assembled on to the prop. I thought you may like some pictures. 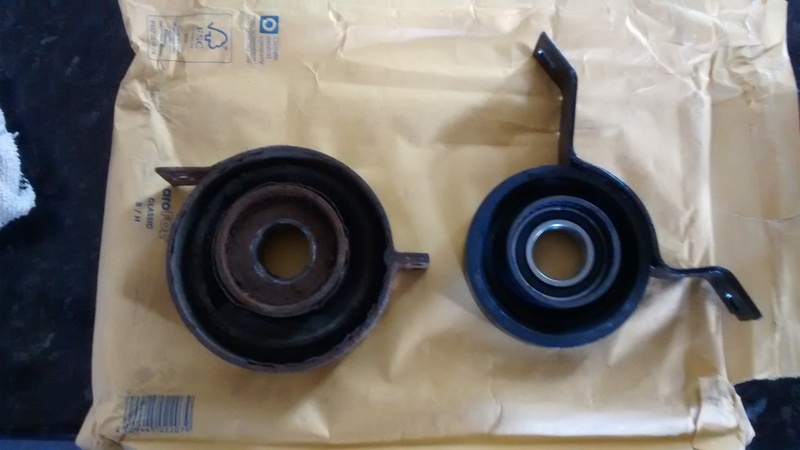 I noticed the new bearing is slightly eccentric in its mounting. I don't think it'll matter. The 'home bent' brackets probably don't help either. 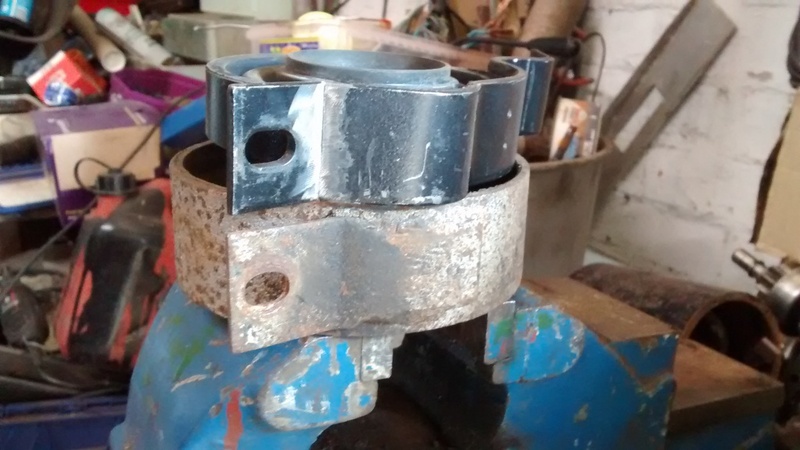 I turned up some 5mm spacers to fill the space left by the new bearing. Arrocuder - how did the fitting go? Hi Mike..... only just picked this up from the link to the thread you reposted. 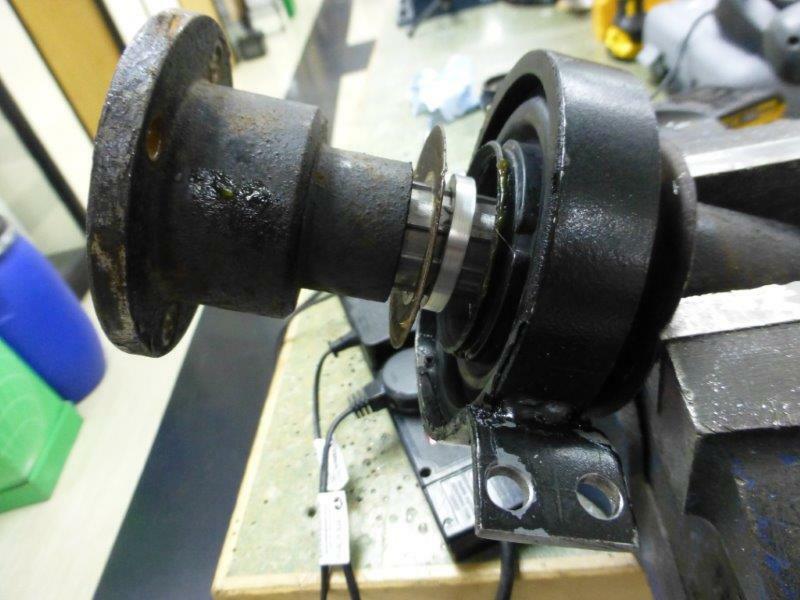 I too was a little concerned because I couldnt centre the bearing any better than you did. The bar is really tough stuff to bend into shape. Test drove it shortly after I completed the job and took it up to around 60 mph with no apparent humming or vibration. Have you test driven yours yet? By the way, your garage/workshop puts mine to shame. Is the last time I put up any more pics on here.